As a self-proclaimed "late bloomer" in the world of newspaper journalism, then 40-something-year-old freelance writer and author Maureen Sullivan-Hartung worked as a reporter for a local small-town newspaper. Included on her beat was the rural community of Everglades City, considered by many to be Florida's Last Frontier. Now, a decade later, many of Sullivan-Hartung's original newspaper articles have provided the nucleus for her latest nonfiction work titled Hidden History of Everglades City & Points Nearby. Hidden History of Everglades City & Points Nearby opens by welcoming readers to the town of Everglades City, originally called Everglade. It continues in a warm, friendly, down-home style to present points of interests, a look at the area's founding families, some notable characters both famous and infamous, and the role the city played in the creation and early development of today's Collier County, Florida. Included are wonderful photographs and visual aids illustrating the book's stories, along with a map detailing various points of interest. It also pinpoints the locations of the original Tamiami Trail aid stations, most of which are gone now. The aid stations were constructed and staffed by Collier County namesake, Barron Gift Collier, builder of the Tamiami Trail, to assist travelers along the 96 mile journey from Naples to the Miami-Dade County line. Though today only one station remains standing along this stretch of roadway, during the 1920s there were six. Each was manned by a husband and wife team hired and paid by Collier. Stations were located at Belle Meade (which is approximately the intersection of US 41 & CR951 in Naples); Royal Palm Hammock (further south at the intersection of CR92 and US 41), Weaver, (across from the present-day Fakahatchee Strand boardwalk); Turner River (near the town of Ochopee); Monroe (the only one remaining along the route… and though currently vacant, it's slated for restoration as a designated historical site and museum) and finally, Paolita, the last station along the Trail and situated at the Miami-Dade County line. Couples hired by Collier to man the stations had specific work assignments. With the buildings themselves being operated as rest-stops, station wives were expected to prepare meals, pump gas and provide other necessary guest services to travelers. Their husbands were each given motorbikes and functioned as deputized roadway patrol officers. The men also provide roadside assistance and first aid to travelers in the event of a vehicle breakdown, flat tire or traffic accident. Patrolling this dark, lonely stretch of roadway was a dangerous job. Anything could happen and frequently did, and several of these men lost their lives in the line of duty. Other interesting vignettes in Sullivan-Hartung's book detail things like the construction of the Tamiami Trail, Everglade as the original Collier County Seat, presidential visitations, historic sites and, of course, the very profitable "square grouper" (or baled marijuana) trade, which ultimately resulted in the largest drug bust in the history of the United States...these being only a few of the many stories included in the book. 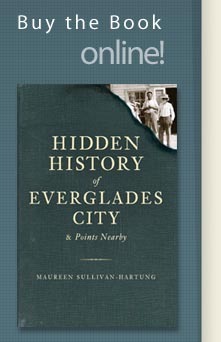 Overall, while the editing could have been tighter, Hidden History of Everglades City is an interesting read, and, given Sullivan-Hartung's warm, intimate writing style, is nearly as comfortable as your favorite slippers.